Okay, I'm back from zombie sick land, and not a moment too soon. There's so much going on around shopping at indie stores, AND the brilliance of buying books for the holidays, that I'm going to have to do link madness on a Friday. First, do not fail to remember that tomorrow, Saturday November 22, is America Unchained! Communities across the country will be encouraged to shop only at independent locally-owned stores -- just for one day. If you care about the economic health of your community, the statistics are persuasive: Studies in Maine and Austin, Texas demonstrate that locally-owned businesses generate 3.5 times the local economic activity as chains. A study of 10 independent businesses and 10 chains in retail, restaurant and service in Andersonville, Illinois demonstrates independent businesses generate about 70 percent greater local economic activity per square foot and slightly more sales per square foot as chains. A study in San Francisco demonstrates the immense economic benefit to the community even a modest shift in personal spending can make. As the American Independent Business Alliance puts it, "Now imagine the impact on your community if everyone shopped locally owned. You can stop imagining and help make it a reality." Here in New York City, the IBNYC (that's Independent Booksellers of New York City) is doing a big push to make book buyers aware of America Unchained -- and member stores are offering lots of incentives to do your book shopping locally on the 22nd. BookCulture and HousingWorks are offering 10% discounts all day long. Bonnie Slotnick is serving free chocolate chip cookies. And there are classes, author events, and all the stuff you love from your favorite indie bookstores. As I wrote on our McNally Jackson blog, "The choice of where you buy your coffee, your prescription, your books, your lightbulbs, or your dinner might seem like just a matter of convenience. But when you choose to shop at a locally owned independent business rather than a chain store, you’re making a choice for what kind of city, and what kind of world, you want to live in." So buy local on Saturday -- it's good for the local economy, it's good for your favorite bookstore, and it's good for you. And the incentives don't stop there. The neighborhood where I live (Park Slope) and the one where I work (SoHo) are both doing a day (or two) of incentives for shopping close to home. Buy In Brooklyn hosts the second annual Snowflake Celebration after 7:00 PM December 4 and December 11, with free treats and drinks, giveaways and discounts at great stores throughout Park Slope. The list of participants is like a who's who of all of my favorite hometown Brooklyn shops! And the evening of December 11 sees the SoHo Stroll, with great discounts, deals and giveaways from the posh shops of downtown Manhattan. These discounts are yours with the purchase of a $20 bracelet, and proceeds benefit the Association for Community Employment for the Homeless, a great organization which helps get work for homeless New Yorkers (our bookstore cleaning staff came to us through ACE, and they do a great job). Shop late, shop local! Buy Books For the Holidays says "Our goal is to promote buying books as gifts for the holidays. We hope to share information about different genres and the book publishing industry, as well as help each other find books for even the most reluctant readers!" It's a brilliant grassroots efforts, supported by bloggers and readers all over. They've got gift book recommendations every day -- you can even email them to get suggestions for books for your most hard-to-buy for loved ones! And you can get a cool button like the one I've got in my sidebar to declare your book-buying intentions. Random House knows that Books = Gifts! This site is for consumers, with giveaways, best-of lists, and other ideas for holiday book buying. And for booksellers, the Books=Gifts DIY site lets you download their clever graphics for your website, newsletter, or store signage. The message is simple and clear -- and kudos to RH for promoting ALL books, not just their own, in such a smart way. If you find best of the year book lists helpful in choosing gifts, the wonderful blog Largehearted Boy has a huge roundup of those that have come out so far -- a good place to start. AuthorBuzz, the brainchild of book promo genius M.J. Rose, is doing a special holiday book campaign too. M.J. explains the campaign on her blog here; starting next week, bloggers can get .gif links for their site that highlight 24 great book gift picks -- and make a percentage on click-throughs as well. Authors, readers, gift-givers, and bloggers all win! In an internet-age take on the advent calendar (one of my favorite traditions), Bookreporter.com has a feature called "A book is the perfect gift because...", with a daily reason why books make great gifts. And then of course, there's what I think of as the headquarters for buying indie and buying books for the holidays: IndieBound. When you sign in to IndieBound, you can now create your own book wishlist on IndieBound -- it's just the books, not connected to any particular store or site. (Even without signing in, you can find your friends' wishlists with the search field on the front page. 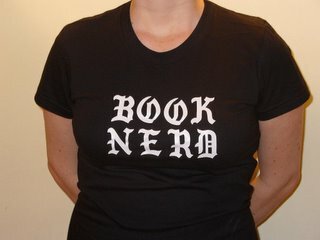 You can find mine under booknerdnyc... hint, hint). AND, when you become a fan of your favorite bookstores, they show up alongside your wishlist, so your loved ones who wish to give you the books you desire can purchase them at the bookstores you most want to support. As Rebecca wrote on our Bookstore in Brooklyn blog, "Nothing is finer than having a book you crave bought for you by someone you like, at a store you love." For example, here's a book I'd recommend highly for holiday giving: the latest from Shaun Tan, author of the award-winning crossover graphic novel The Arrival. His new book, Tales from Outer Suburbia, is really a short story collection, illustrated with Tan's beautiful, sometimes enigmatic art. It puts the mystery back into the tame streets and houses of the suburbs, revealing the adventure, romance, and pure strangeness around us. I'd recommend it for reluctant young adults, precocious young readers, or grown-ups with a well-developed sense of wonder. Click on it to find out more, or to buy it at an indie bookstore near you. And if you have your own lit blog, consider becoming an IndieBound affiliate to spread the book love. Happy holiday season, and happy reading! Ooooh, I love Shaun Tan. Especially The Red Tree -- beautiful, but totally bizarre. Must check this new book out. Excellent post and interesting study done by the sociologists at University of Maryland.